On a beautiful sunny Saturday morning ten ladies made their way to Charmayne’s place in Haumoana, all intent on learning more about silver smithing. 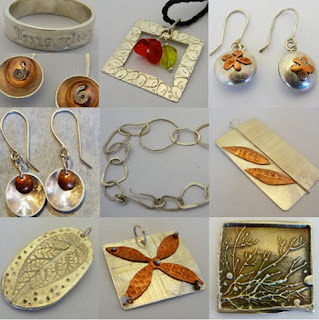 One group worked with "Art Clay Silver" (precious metal clay), the other with silver sheet and wire, and also with copper. Some participants were beginners in both fields, some had already created jewellery with the silver clay. The workroom was filled with metal work noises coming from the students: sawing, drilling, hammering, stamping out metal, the hissing of the soldering torch; only when dinner was served an end could be found to the busy day. Winding down with a ginger & lime punch, we sat down outside for a catered dinner, ending with a chocolate cake decorated with chocolate leaves and fresh white roses. The groups swapped workplaces and medium on Sunday, and fueled by all sorts of goodies more jewellery pieces were created right to the last minutes before the final photo shoot. A very intensive weekend indeed, challenging and extending skills, filled with great experiences for all and a feast for all senses it was too! And we were told, the pieces made already attracted many compliments! The 2nd Silver retreat is planned for 12 & 13 March ... want to know more about it? http://www.silverschool.felt.co.nz/ is the place to go!